The oil and gas exploration and production business, INEOS, has submitted an updated travel plan regarding its proposed test drilling well at Harhill, leaving Rotherham Council in a difficult position just a week away from a public inquiry. The authority's transport planner believes that updated plans provide mitigation to his earlier concerns and reasons for refusal. The Council's planning board does not agree. Having been given the "hurry-up" by Government, INEOS appealed to the Planning Inspectorate over the non-determination of the application for a drilling rig on Greenbelt land between the villages of Harthill and Thorpe Salvin. It said it had encountered "unreasonable delays" in dealing with Rotherham Council. 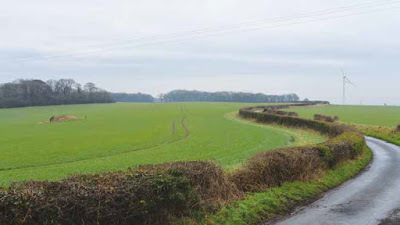 The planning board discussed the application in January where members agreed with the authority's planning officers who put forward reasons why the application would be refused based on concerns over the impact on the highways and on ecological surveys and assessments undertaken by the applicant that "fall considerably short." The decision would form the basis of its stance at a public inquiry, which is due to start at Riverside House on April 24. The application would provide temporary permission for a maximum of five years and the operation would involve months of various site investigation surveys and site preparation before a period of drilling, coring and testing. A well would be drilled to approximately 2,800 m using a drill rig of maximum 60 m rig height followed by three months of testing. 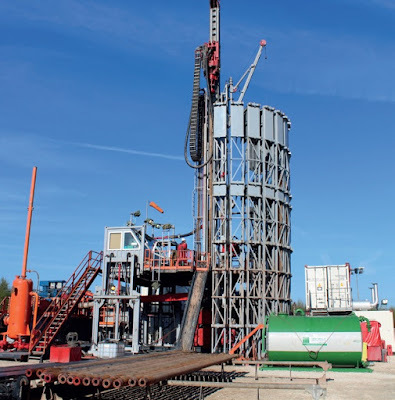 The Common Road site would be restored after the activity has taken place and tests will be carried out on the suitability of the area for hydraulic fracturing (fracking). Earlier mitigation measures drawn up for INEOS were rejected by the Council's transport planners. The proposals could generate a maximum of 70 daily vehicle movements during the site development and measures such as passing places and junction improvements were deemed to "not satisfactorily address the road safety concerns regarding the introduction of a significant number of additional large commercial vehicles along these narrow country lanes." Now the traffic management plans have been enhanced with the addition of a number of new passing places to address concerns regarding the conflict between traffic, cyclists and pedestrians. For example, ten formal passing places are now intended on Packman Lane, an increase from the three previously intended. Where passing places are not visible to oncoming road users, INEOS intends to control traffic movements through using a banksman and "Stop / Go" signs. The new mitigation means that a temporary traffic regulation order (TTRO) would not now be needed. The authority was unlikely to approve the original order put forward by INEOS. Following an urgent addition to the agenda, Ian Ferguson, senior highway development control officer at Rotherham Council, told members of the planning board this week: "It is considered that the enhanced traffic management plan measures constitute a significant improvement and satisfactorily address road safety concerns. Opposition to the development on road safety grounds could not therefore be justified subject to appropriate conditions." Following input from local campaigners and councillors, members of the planning board discussed the updated transport plans. Critical of the applicant for submitting further information close to the start of the public inquiry, the members went against the recommendation to remove transport grounds from the authority's opposition to the proposal. The decision means that the Council's transport planner will have to put forward the authority's views at the inquiry whilst having the professional opinion that the updated mitigation proposals would mean that the application could be approved on transport issues. The authority's opposition will continue to be on transport and ecological grounds and the applicant will also have to address concerns from other objectors regarding the use of Greenbelt land, noise, drainage, etc. Good sense shown by our Councillors once again. There's an error in your report however, as you have described the location of the site at Woodsetts, not Harthill. The location details refer to the Woodsetts application. This is Harthill. Please can location details be updated. This site is not at Woodsetts near Dewidales it affects Packman Lane, Harthill Field Lane and Bondhay Lane. The names of the roads are all Lanes...definitely not suitable for HGV'S. Thanks for letting me know. I've updated the article. Makes no.difference as central government will.step.in and allow it,afterall nation needs energy supplies and we cant depend on Russian Gas ! We don't rely on Russian gas! Dosnt alter fact nation needs gas,and a domestic supply we can rely on in answer.Whats your solution to getting a supply for future then.And actually quite a large percentage of UKs gas supply at present dose come from Russia.